We examine in depth your Intentional Inner Aspect and Field, as well as your energetic System of Aspiration. Welcome to Workshop Five of the ONA Workshop Series. In this workshop, we will study Aspiration, the Fifth principle of ONA and the principle that underlies your (Intentional) Fifth Field and Inner Aspect, and System Five. All about your fifth System, Field and Inner Aspect. To aspirate means "to breathe". At one time, that was the most a living being could strive for—to continue to breathe! However, as eons have progressed, it became possible to hope for more. How to meditate using the Diaphragmatic Breath. This is a great way to open up and allow your aspirations to become consistent and increased. Remember any breathing technique primarily effects the System it is associated with and yet it can ultimately effect any and all other Systems. 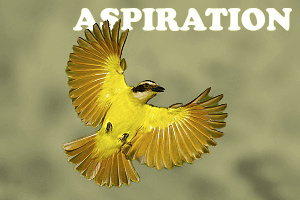 All about the color of Aspiration (yellow). Yellow is the color that allows us to express ourselves more easily to others. It invites us to share in group activities in forms of socializing, counseling, and advertising. Yellow balances depression. The &apos;sound&apos; of Aspiration and how to use it. Stillness allowing the presence of supportive factors to take place which harmonize and blend. The elements present, although in repose, form blending patterns which will reincorporate all the energies into their original sequences. A representation of this energy is one complete breath. How to increase your lung capacity without sweating. Aspirating to increase aspiration is a fine aspiration in itself! The goal with this hands-on procedure is to allow you to increase the time a breath can be taken and to increase its intensity. Breath is essential to the build up of energy within your systems. This kind of energy increases the bodies ability to oxygenate the cells and the energy of the cells can build and can pass on that build up to all of your and those you work with. How to practice several Aspiration techniques. You are a many-layered being. Imagine the writer of a movie script, in which one character is an author, in whose book is a character who is also an author, who has written a book in which the main character has entered a bowling tournament. In this scenario, there are four Created Selves—and all are aspects of the same person! Plus, there are more; for the writer of the movie script is, himself, the Created Self of an even deeper-level being.